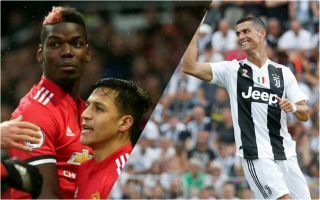 Juventus star Cristiano Ronaldo is reportedly pushing his club to beat Real Madrid and Barcelona to the transfer of Manchester United midfielder Paul Pogba. According to Diario Gol, Ronaldo would dearly love to see Juve get the better of two of his major rivals in European football – Real Madrid president Florentino Perez, and Barcelona forward Lionel Messi. The report is the latest to claim Pogba is desperate to get away from United after becoming unsettled at Old Trafford, and it could be that he’ll be targeted by his old club Juventus. The France international showed some of the best form of his career during his time in Turin, and it would undoubtedly be a major boost for the club to have him back. Paul Pogba to leave Manchester United before the August transfer deadline? Although Pogba has struggled to replicate that form in England, he showed flashes of his old self with his quality performances with France as they won the World Cup this summer. Having signed Ronaldo from Real this close-season, if Juventus could also find a way to lure Pogba back to Italy it would be a serious statement of intent from the Serie A giants as they look to build on their domestic dominance by finally conquering Europe.